Congratulations on your positive response to the Mid Staffordshire NHS Foundation Trust Public Inquiry (The Francis Inquiry) and commitment to putting ‘Patients First and Foremost’. “We must make the quality of care as important as the quality of treatment. This means celebrating and spreading excellence in care; it means challenging mediocrity and those hospitals – and other providers of care – that are doing too little to learn and improve; and above all, it means protecting patients and people who use services from avoidable harm. We know that pockets of poor care exist in many parts of the NHS and this must never be acceptable.” Clean Air in London emphasis. 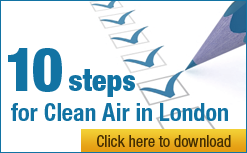 Clean Air in London (CAL) is a not-for-profit company limited by guarantee with a mission to achieve full compliance with World Health Organisation guidelines for air quality throughout London (and elsewhere). Camfil Ltd has supported, for nearly two years, CAL’s campaign to building public understanding of indoor air quality. An investigation by CAL has found that Department of Health (DoH) guidance for air filtration for healthcare premises, including hospitals, has not been updated to ensure full compliance with British and European standard EN 13779:2007 for indoor air quality. Perhaps worse, the current DoH guidance: recommends the use in general areas of G4 filters (which are appropriate in warehouses or workshops to remove ‘dust’ or as ‘pre-filters’); and advises that the use of high-efficiency particle air (HEPA) filters, which can reduce significantly methicillin-resistant staphylococcus aureus (MRSA) and other environmental contamination, should be kept to a minimum. Patients should be protected from dangerous airborne particles from outside and within healthcare premises not just ‘dust’, ‘odour’ and ‘staining on surfaces’ as the current DoH guidance largely seems to imply. BS EN 13779:2007 should be the basic requirement for all healthcare premises with mechanical ventilation and elsewhere. G4 filters are ‘coarse filters’, appropriate in warehouses or workshops to remove ‘dust’, or as ‘pre-filters’, sometimes in dusty environments to protect the main air filters from blocking, not ‘general ventilation filters’ as stated in the current DoH guidance. HEPA filters should be the norm – not the exception – for operating theatres and other high care environments, whether: integrated into central air handling systems; installed at the point of use above the ceiling; or used as portable units. It seems there is a fundamental failing in DoH guidance for healthcare premises, including hospitals, that may be entirely cost-driven with little or no attention given to the need to putting ‘Patients First and Foremost’ and ‘protecting patients and people who use services from avoidable harm’. CAL has found that DoH guidance for air filtration for healthcare premises, including hospitals, has not been updated to ensure full compliance with British and European standard EN 13779:2007 for indoor air quality. Perhaps worse, the current DoH guidance: recommends the use in general areas of G4 filters (which are appropriate in warehouses or workshops to remove ‘dust’ or as ‘pre-filters’); and advises that the use of high-efficiency particle air (HEPA) filters, which can reduce significantly methicillin-resistant staphylococcus aureus (MRSA) and other environmental contamination, should be kept to a minimum. Paragraph 3.13: Given that almost all viable particles originate from the occupants of a space and not from the incoming air, dilution is the more important factor aerobiologically. Therefore, for general areas a G4 filter is suitable. More critical areas will require an F7 filter. High-efficiency particulate filters air (HEPA) filters are required only in ultra-clean systems. Paragraph 4.130 (Primary filters): General ventilation supply plant should incorporate primary air filters of grade G3, sized for a maximum face velocity of 2 m/s. Additional coarse pre-filters may be justified where the intake air is exceptionally polluted. Paragraph 4.131 (Secondary filters): Where a higher standard of filtration is required, secondary bag or pleated-paper panel filters can be used. Rigid frame filters incorporating pleated-paper elements are preferred over bag filters for critical care applications such as operating theatres. Paragraph 4.132: In urban or other areas of high atmospheric pollution, a higher standard of filtration may be justified to reduce the level of staining to internal finishes. Paragraph 4.135 (High-efficiency filters – HEPA and ULPA): HEPA filters are expensive. Therefore, their use should therefore be kept to a minimum. Applications requiring HEPA filters include the air supply to aseptic suites in manufacturing pharmacies and the discharges from microbiological safety cabinets. Paragraph 4.137: HEPA filters are sometimes fitted in extract systems to capture hazardous substances or organisms. Design provision must be made for the subsequent safe handling of contaminated filters by maintenance staff. Paragraph 7.45 (Operating department ventilation systems): For general operating theatres the air supply is filtered in the [air handling unit (AHU)]. Terminal or HEPA filters are not generally required. Paragraph 8.160 (Ultra-clean ventilation microbiological tests): There is little value in performing microbiological sampling in a new theatre supplied with ultra-clean ventilation (UCV). The foregoing filter challenge tests, air velocity measurements and entrainment test should have proved that the system operates satisfactorily and achieves the contracted level of performance. The HEPA filters will remove bacteria-sized particles from the air supplied through the UCV terminal. Therefore there will be an insignificant number of bacterial and/or fungal [colony forming units (CFU)] present until the theatre is actually used. high efficiency particulate air filters (HEPA/absolute) remove virtually all particles from air. These may be required in order to reduce contamination in the working area either biologically or in terms of particle count. Paragraph A1.10: Filters may be fitted to extract systems to protect energy-recovery devices. They are also fitted to remove biological, radiation or chemical hazards. They are often contained in a “safe change” facility in order to protect those carrying out maintenance. Paragraph A1.11: Activated carbon filters will reduce odours in extracted or recirculated air. The five year EnVIE project published a major report titled ‘Co-ordination action on indoor air quality and health effects’ in February 2009 with an update titled ‘Promoting actions for indoor air quality (IAIAQ)’ in 2011. These reports aimed to increase understanding of the Europe-wide public health impacts of indoor air quality by identifying the most widespread and significant causes for these health impacts and evaluating the existing operational building and housing related policies for controlling them. EnVIE estimated the UK as having the worst health effects of the EU 27 countries for ‘non-ideal’ indoor air quality for asthma and chronic obstructive pulmonary disease (COPD) and among the top three worst for sick building syndrome and respiratory infectious diseases. The same report estimated the UK as having the worst contribution to exposures for bio-aerosols and among the top three worst for VOCs and pathogens. EnVIE ranked the UK worst for the following sources of indoor air pollution: water systems, dampness and mould; ventilation and conditioning systems; and building materials and among the top three worst for: ambient (i.e. outdoor) air quality; furnishing, decoration materials and electric appliances; and cleaning and other household products. EnVIE recommended: general policies (e.g. to build public understanding); building construction (e.g. integrate indoor air quality into policies on urban development and develop moisture control guidelines for buildings); ventilation (e.g. regularly inspect and maintain all heating, ventilation and air conditioning systems (HVAC), include BS EN 13779:2007 compliant filters in HVAC systems, ban all unflued combustion heaters and integrate with energy performance inspections); consumer products (e.g. testing and labelling of products); and occupant behaviour, operation and maintenance (e.g. best practice manuals for major buildings). Further action is needed separately to reduce exposure to ETS (particularly for children). Please simultaneously: investigate and update DoH guidance for ventilation for healthcare premises; and ensure that all healthcare premises with mechanical ventilation comply fully with BS EN 13779:2007. Please consider ‘avoidable harm’ as part of your investigation and response. CAL is keen also to encourage the DoH to foster the role of filtration and the need to design systems so that they can integrate efficient air filters, as minimum requirements. This will become increasingly important as buildings become virtually ‘airtight’ to increase energy efficiency. Finally, please consider this letter as request also under the Environmental Information Regulations 2004/Freedom of Information Act 2000 for information held by the DoH about indoor air quality within healthcare premises, particularly NHS hospitals. You will appreciate that this letter raises concerns about a fundamental aspect of patient care. Please therefore please put substance behind your recent words and take appropriate action. I have copied: the Shadow Secretary of State for Health; those who ‘[pledged] to learn the lessons from Mid Staffordshire NHS Foundation Trust, help to build better care for every patient and do everything in [their] power to ensure it does not happen again’; and relevant others.